the code you sent works correctly i think. The light is attached to the camera and behaves like it should. I didn't attach any light to camera, they are both with different position. Why it so much different, since i have almost same scale data like in ur demo? Or i missing something? I've found your mistake then. You pass light position as 0,0,0, but in the shader we calculate from viewSpace. That means that the light is at camera position, but the mesh is somewhere else. So you need to convert the position to view space. how can i convert existing viewspace normal buffer back to worldspace normal? Found it .... was thinking reconstruct a worldnormal buffer and keep in to texture, or calculate by using the helper function everytime when we ned in shader? which 1 is faster? matrix multiplication is faster than one more rendertarget. is the spotlight work? how can i make it work? I've Reenabled directional lights (sun lights) but not yet spotlights. 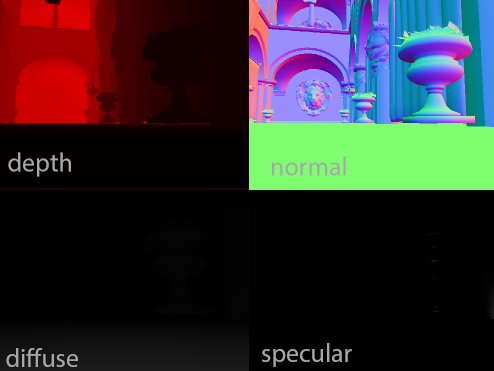 I think the old spotlight Shader files are still there though in "unused". nice...look forward for ur spotligting implementation. I think I provided a link to the meshes of the scene in the download. They are generic and were made for graphics research. How can it be possible to compare the 2 values to make shadows ? I actually switched to linear mainly for SSAO. Though I will admit my implementation is not great. I have other stuff to work on right now though. I was wondering how I could make my shadows work with my non linear depth and yours cold work too with the same maths.